Head of System Security, IT Manager, System Security Executive and above. Designed specifically for information security professionals who are preparing to sit for the CISM exam, the course focuses on the four content areas of the Certified Information Security Manager (CISM) job practice: information security governance, risk management and compliance, information security program development and management, information security incident management. Sample exam items will be used throughout the course to reinforce content and familiarize attendees with the CISM exam question format. Understand the broad requirements for effective information security governance, the elements and actions required to develop an information security strategy, and be able to formulate a plan of action to implement this strategy. 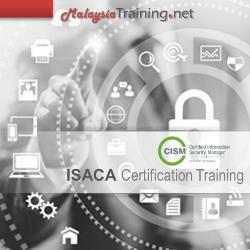 Develop and manage an information security plan. Effectively manage information security within an enterprise and develop policies and procedures to respond to and recover from disruptive and destructive information security events.